My Blue Fronted Amazon is posted as lost on the website. WE HAVE BEEN REUNITED! 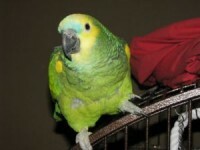 My blue fronted amazon parrot flew away today when I was transferring him from his outdoor to indoor cage. He has full flight. He went missing near the Cathedral and Pioneer Village area. If you see him please contact me as soon as possible.